int scan_amount = 40;                   //Amaunt of scans for each point. The result is the mean. This would increase the delay for each scan. float z_layer_height = 0.5; //in mm     //Layer height. The amount of mm for each layer. int lead_screw_rotations_per_cm = 8;    //How many rotations needs the lead screw to make in order to make 1cm. 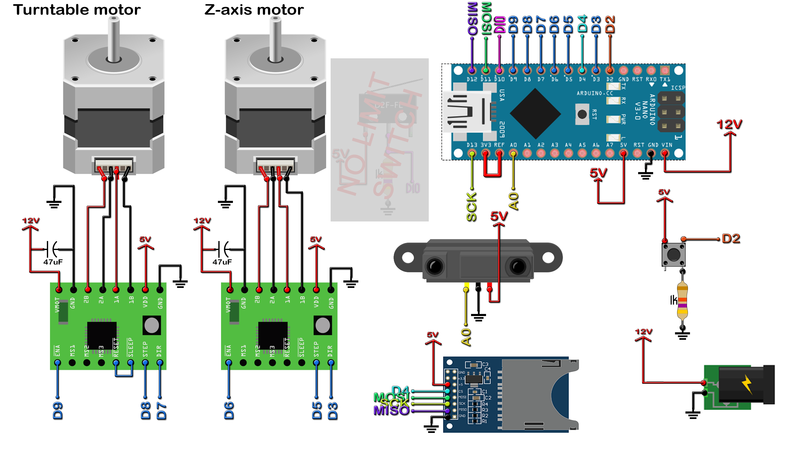 int steps_per_rotation_for_motor = 200; //Steps that the motor needs for a full rotation. /*My threaded rod needs 8 full rotations for 1cm. A full rotation is 200 steps in my case. We need 1600 for 1cm. So, we need 80 for 0.5mm. The amount is calulated automaically. distance = analog/scan_amount;        //Get the mean. Divide the scan by the amount of scans.